PLEASE NOTE: After you receive this software, you will need to verify your student or educator eligibility with Adobe. After your eligibility is processed by Adobe, you will receive an email with a software Activation Key. Create collages with fewer clicks, and choose from stylish new templates that look great as Instagram posts, and more. * Pan and zoom photos in your collages and replace backgrounds, too. This brilliant new feature is set to revolutionize the way people use TurboCAD! Similar to the functionality found in other products such as Generic CAD or AutoCAD, the user now has the ability to set up keyboard shortcuts that consist of either two or more keystrokes to quickly invoke any TurboCAD command. These keystrokes are sequential and do not need to be a keyboard combination. The sequence of keys is initially invoked by pressing and releasing the Control (Ctrl) key and then a set of subsequent keys to invoke the specific command. This effectively allows the user to keep the left hand on the keyboard in the right hand on the mouse massively boosting productivity. The LightWorks rendering engine is now once again included in TurboCAD and will no longer be an optional plug-in. 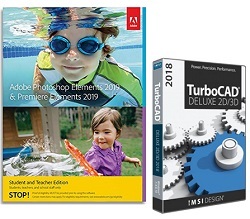 TurboCAD 2018 includes LightWorks 9.1 SP5. An external sound mixer module with hardware audio processing. Contains over 3.5-million royalty-free clipart images, photos, web graphics, animations, fonts and sounds.